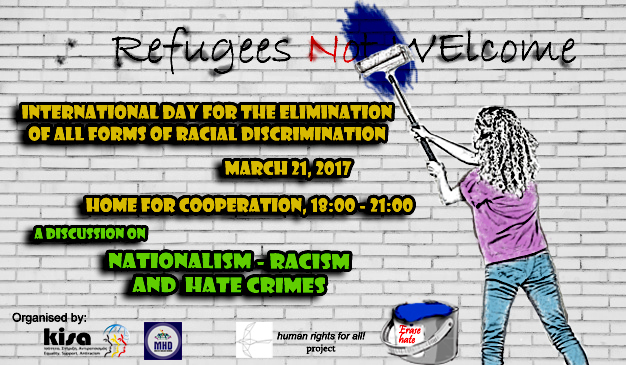 On occasion of the International Day for the Elimination of all forms of Racial Discrimination on March 21, KISA – Action for Equality, Support, Anti-racism, and “Refugee Rights Association” (RRA), organised an open discussion entitled “Nationalism – racism and hate crimes. ” The discussion took place at the Home for Cooperation, on Tuesday (21/03/2017) at 18:00. The sharp rise in hate crime in Britain before and after the referendum on leaving the EU[i], and the increase of such crimes against migrants in the USA after D. Trump’s election[ii], are just some examples that confirm the link between nationalism and racism with the commission of hate crimes. Concerning Cyprus, the repeated attacks against Turkish Cypriots by Greek Cypriots nationalists, cannot be perceived as isolated incidents but as consequential of the outbreak of the Greek Cypriot nationalism and the intense mobilisation of right-wing / neo-Nazi forces during the last period. 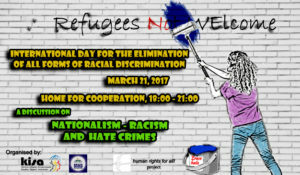 Based on all the above and taking seriously into account the incalculable consequences of hate crimes, both on victims and on the society as a whole, the event focused both on the upsurge of nationalism – Racism and their connection to the increase in hate crimes, as well as in ways to effectively address such phenomena. More specifically, during the first session of the event, Dr Yiannis Papadakis refereed to the connection of nationalism and racism through an anthropological approach while Mr Loizos Loukaides wspooke about the promotion of nationalism and racism through education. Thereafter, the researched Mete Hatay presented the situation on the commission of hate crimes in the north part of Cyprus, and the researcher Ms Eleni Evagorou of Prometheus Research Institute spoke about the reproduction of nationalism / racism through Cypriot state’s institutions and social media. In the second session, Mr Xenios Mamas form the Police, focused on the role of the police in combating hate crimes, while Mr. Andreas Riris from the Union of Cyprus Journalists presented practical ways to encounter nationalism and racism in media. Finally, a representative of KISA refereed on the ways to tackle such phenomena from the perspective of civil society.